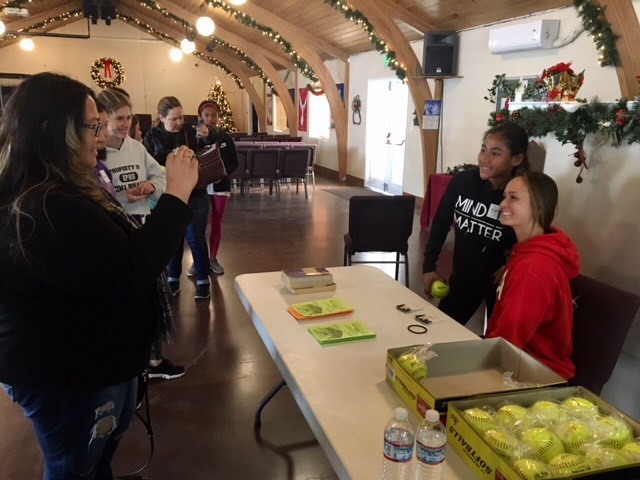 On Saturday, December 16th, Team USA star and Sacramento native Ali Aguilar shared her testimony with 50 young softball players and their families and coaches. The morning started with a softball clinic for the girls followed by a lunch and 2 hour discussion time with Ali at New Hope Community Church. Ali shared about how the role her relationship with Jesus has shaped her and grounded her throughout her sports career. The clinic and lunch spurred on many spiritual conversations between attendees and ministry staff and the kids really enjoyed their time! The event also saw several families in attendance who had previously been resistant to attending a Sunday church service but felt comfortable attending a softball clinic and lunch. Invitations to join upcoming New Hope Community Church events were also shared during the time together. This event was organized by New Hope Community Development Corporation whose mission is to bring holistic revitalization to low income communities through educational enrichment, economic empowerment and housing services thereby demonstrating the love of Jesus Christ to those in need. Church Volunteer Network was honored to contribute support for this event through our Gospel Project Support Fund. Thank You New Hope Community Development Corporation and New Hope Community Church for providing gospel engagement with families in the South Sacramento and Meadowview communities!